A research team at Nokia Institute of Technology (INdT) in Brazil have developed a technology that will allow for a more efficient connection when moving between different cell sites, and also at the same time improving the operators networks. On mobile Internet systems such as 3G and LTE, the users mobility is managed by the use of Proxy Mobile IPv6 (PMIPv6), a protocol standardised by the Internet Engineering Task Force (IETF). To communicate with the outside world, your mobile phone is connected to a particular cell site for both calls and a data connection. At the same time hundreds, thousands or maybe even tens of thousands of people are also attached to that same cell site, at the same time depending on area and population. What the INdT propose is a new way of sending data to the operators cell station, using what they call Bulk PMIPv6 Binding Updates that can greatly reduce the amount of traffic sent to and from the cell station. In a typical Proxy Mobile IPv6 domain, a local mobility anchor serves multiple mobile access gateways and the capacity of that node, with respect to the number of mobility sessions that it can host is quite high, it can typically be in the order of few millions. But today we not only talking on our cellphones, it’s also getting more common to use a data connection in our increasingly mobile life. As the number of mobility sessions hosted by a local mobility anchor goes up, so is the amount of signaling traffic related to periodic binding update. The solution that INdT brings is to identify many users within the cell range and assign them one single ID, rather than giving every single one an ID. This saves the constant back and forth signalling and in turn reduces load on the network and reduce bottlenecks that ultimately lead to performance degradation. By creating a group of mobility sessions that are part of the same logical group, and giving them common group identifier to share, the number of session calls can be greatly reduced. Even though Bulk PMIPv6 Binding Updates only applies to mobile Internet connections, systems are moving towards providing voice services via Voice-over-IP (VoIP), and this will most likely increase as LTE adoption evolves. If VoIP service replaces the GSM commuted voice service in the future, then Bulk PMIPv6 Binding Updates can be applied for voice calls as well. The solution was developed and co-authored with researchers from Nokia, Ericsson and Cisco. 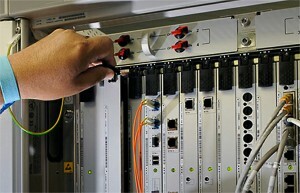 The adoption of this technology by manufacturers of networking equipment is optional, will take place gradually and be available for purchase by the Brazilian operators from the end of 2012.